Crowns or Fillings - Which is the Best For Me? Very often, people don’t know the difference between dental crowns and dental fillings and why one is used instead of the other. It’s very important to know the difference and why your dentist might choose one over the other. Knowing the difference will help you make a more informed decision about your dental care. The basic difference between crowns and fillings has to do with how severely the tooth is damaged and what is needed to repair it. Fillings are used when there is only minimal damage or minor decay of the tooth. Crowns are needed for teeth that are severely damaged and can’t be repaired with just a small filling. If your teeth have signs of decay it is essential that you see your dentist right away to determine if you need a crown or a filling. The longer you delay your treatment, the worse your teeth will become. The following paragraphs explain crowns and fillings in more detail. If there is a severe case of decay and a filling is not enough to fix it, your dentist will probably suggest a crown. A crown is like a cap or cover. Dentists usually recommend a crown if you have a chipped, or broken tooth resulting from decay. 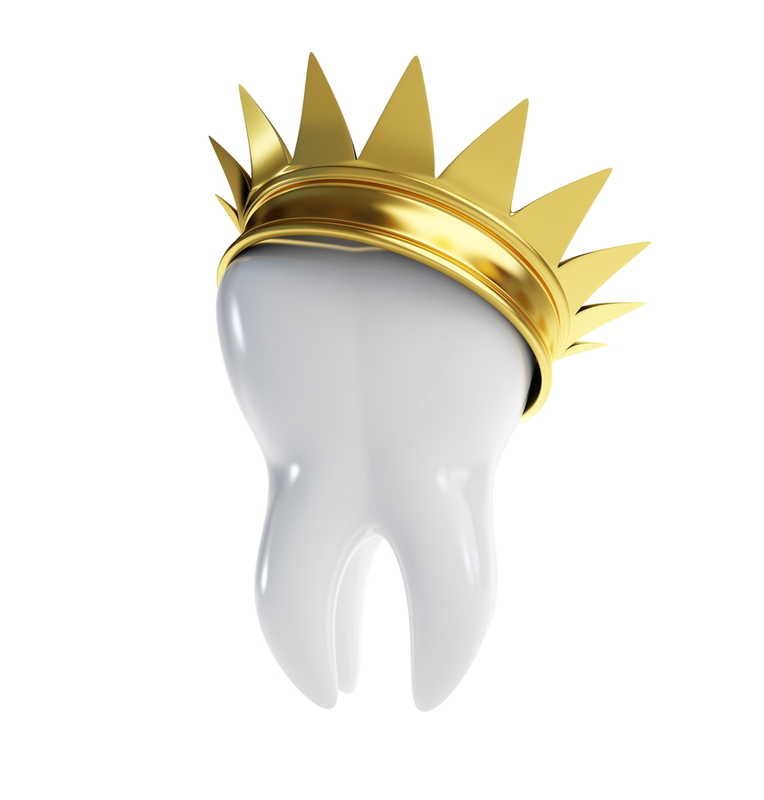 The crown will protect the tooth from further damage. A crown will make the tooth look normal again and will provide a strong surface so that you are able to still chew your food. Dental crowns are made from a mold of your mouth and fit snuggly over your natural tooth. Fillings were invented to repair teeth with only minor damage from tooth decay. Cavities are caused by plaque and bacteria that are eating through the enamel of your tooth, causing decay. When your tooth becomes decayed, the decayed portion must be removed and the open spaced sealed with a tooth-colored composite. A dental drill will be used to remove the decayed part of the tooth. To prevent tooth decay from getting worse, you need to see your dentist as soon as possible. An even better idea is to see your dentist on a regular basis for checkups and cleanings. This will help prevent tooth decay from starting to begin with. It’s very important that you brush your teeth twice per day with a fluoride toothpaste and floss each day as well. If you would like to learn more about crowns and fillings the best thing you can do is talk to your dentist. They will explain decay prevention in detail and explain why or why not a crown or filling is needed. Taking care of your teeth every single day will help decrease the chance of you needing a crown or a filling in the future. If you have a cavity, or more severe tooth decay, you need to see your dentist as soon as possible. At Simply Smiles Dentistry, we can help you decide if you need a filling or a crown, and educate you on decay prevention.